With the start of a new year approaching, many Americans are setting goals to get better, happier and healthier in 2016. To find out where people want to make improvements in their lives this coming year, GoBankingRates surveyed the most popular New Year’s resolutions for 2016. According to the survey findings, money goals won’t be as big of a priority for many Americans. Instead, most survey respondents plan to have fun in 2016 and seize the day. The survey findings include the most popular resolutions overall, as well as insights into resolutions Americans are making by age, gender and even the state in which they live. 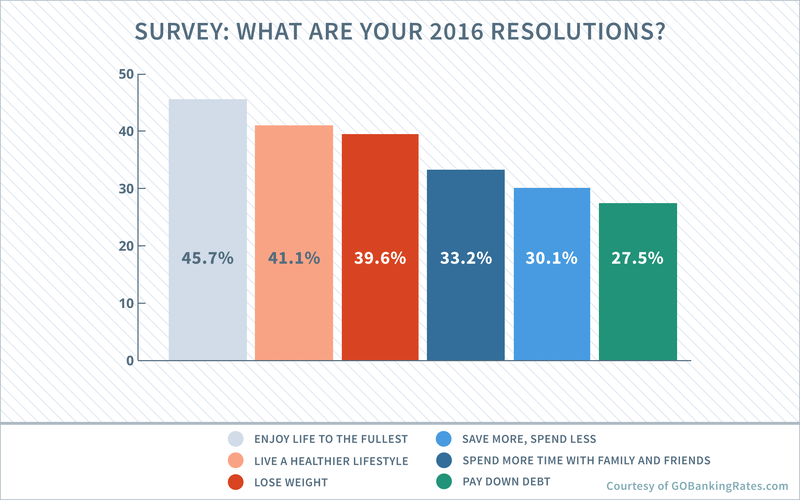 About one-third of the total number of respondents selected “none of the above,” indicating that they either don’t plan to make a resolution for 2016 or their goal wasn’t represented among the offered choices. These analyses on resolutions were conducted on only the remaining portion of responses that selected one or more of the resolutions above. Of those who chose a New Year’s resolution, most people (55.3%) are pretty realistic about their New Year’s resolutions and only plan to tackle one goal in 2016. Still, 23.7% of respondents are setting two to three resolutions, and 21% are aiming for four or more resolutions. “Enjoy life to the fullest” is the most popular New Year’s resolution. Nearly half (45.7%) of survey respondents are planning to set this as one of their goals for 2016. The second most-popular resolution is “live a healthier lifestyle” with two in five (41.1%) saying this would be one of their resolutions. “Lose weight” is nearly as popular, chosen by 39.6% of survey respondents, and a third (33.2%) of respondents want to “spend more time with family and friends” in 2016. 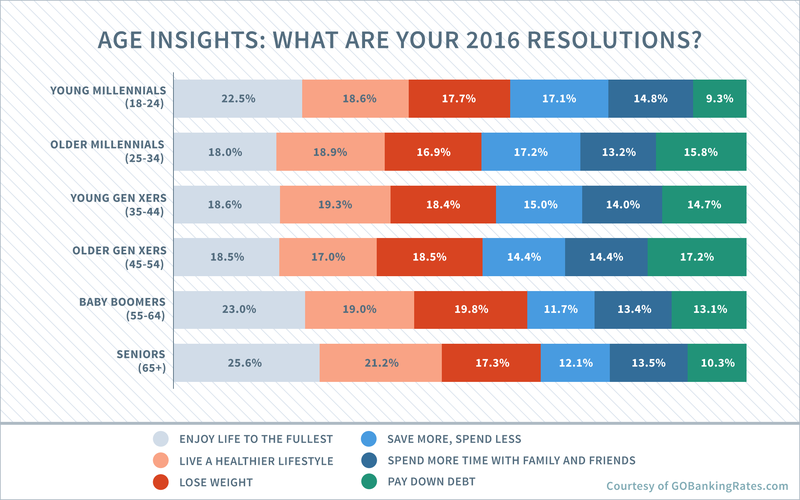 The two least-popular 2016 New Year’s resolutions are those related to finance. “Save more, spend less” is a goal for only 30.1% of respondents, while “pay down debt” is a focus for 27.5% in 2016. But despite this, a significant portion of Americans — 57.6%t — plan to set one or both of these finance-related resolutions, a portion nearly equal to the number of Americans who want to “enjoy life to the fullest” in 2016. Women are slightly more likely to pick multiple resolutions than men. While men selected an average of two resolutions each, women plan to set an average of 2.2 of the six resolutions for 2016. Because of the difference in the number of responses selected, women are more likely than men to be setting each resolution, except for “pay down debt” and “live a healthier lifestyle.” More men said they plan on getting rid of debt in 2016, at 27.6% compared with 26.7% of women. About an equal number of men and women have a goal of living a healthier lifestyle, at 40.1% and 40.2%, respectively. The biggest difference between the genders is for the resolution “enjoy life to the fullest,” which women are 15% more likely to select than men (47.6% vs. 41.4%, respectively). Women are also more focused on losing weight (40.3% vs. 36.7% of men), save more and spend less (33.7% vs. 30.8%), and spend more time with loved ones (31.4% vs. 27.8%). When it comes to making resolutions, millennials’ youthful optimism shines through. Americans ages 18 to 34 are setting significantly more resolutions than any other age group, selecting 2.6 resolutions on average. Members of other age groups said they plan to set around two of the six resolutions each. Millennials: Young millennials (ages 18 to 24) are the most concerned of any age group with spending more time with loved ones, with this New Year’s resolution accounting for 14.8 percent of total responses from this group. They are also the least likely to resolve to pay down debt in 2016, likely because they have had less time to accrue debts and also feel they have more time to pay them off. However, millennials overall (ages 18 to 34) are the most concerned with spending less and saving money. This age group will likely have lower incomes than those older than them, as well as less experience managing money, so the need to budget and save is apparent. This also reflects the high priority millennials place on saving and financial responsibility. Generation X: Among Gen Xers, the younger part of this cohort (ages 35 to 44) is focused more on living healthier in 2016 than any other resolution, while older Gen Xers (45 to 54) are the least concerned with this goal of any age group. Older Gen Xers are also the group most focused on paying down debts in 2016. Baby Boomers: Members of this age group (ages 55 to 64) are resolving to trim their waists in 2016, with 19.8 percent resolving to lose weight. They are also resolving to “enjoy life the fullest” next year. But, they are the least concerned with trimming their budgets by saving more and spending less. Seniors: Last but not least, seniors (ages 65 and up) know the importance of getting the most out of life, with “enjoy life to the fullest” accounting for more than a quarter of total responses from this age group. Although seniors are not that concerned with losing weight compared with some other generations, “live a healthier lifestyle” accounted for more than 21 percent of total responses in this age group. Money goals like saving or paying down debt, however, are less-frequent resolutions among seniors. GOBankingRates’ survey also provides insights into the top New Year’s resolutions in each state. At the state level, “enjoy life to the fullest” remains the most popular resolution as the top pick of residents in 30 states, including Washington, D.C. (not shown on the map). In 13 states — D.C. included — “lose weight,” is a top resolution, and “live a healthier lifestyle” is a top resolution in 14 states, including D.C. Two states, Arkansas and Wyoming, selected “Spend more time with family and friends” as a top resolution. Only four states had financial resolutions as top picks. 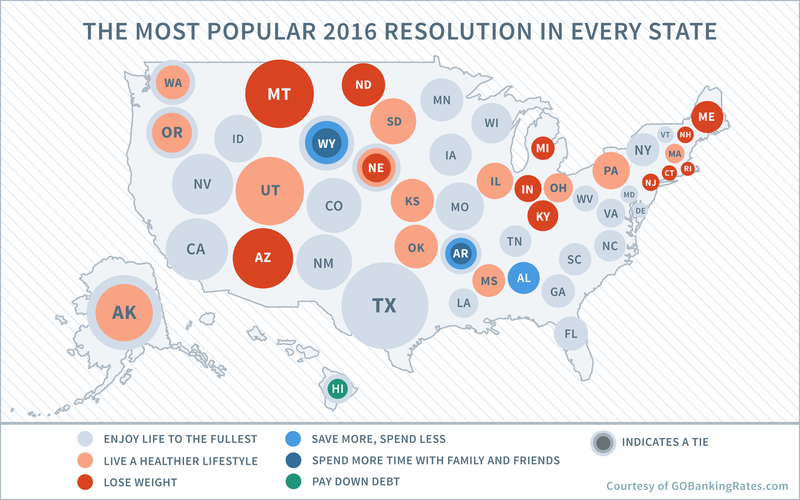 Residents of Alabama, Arkansas and Wyoming are making “save more, spend less” a top priority in 2016, while Hawaii is the only state that named “pay down debt” as a top resolution. Trying to “live life to the fullest” is a worthy aim for next year. While this is the most popular New Year’s resolution for 2016, it can be hard to achieve this goal if you aren’t addressing major stressors in your life — like money — that can hold you back. “It’s well known that it’s hard for most people to stick to their New Year’s resolutions,” Huddleston said. You can probably remember a resolution you set on Jan. 1 with the best of intentions, only to forget all about it by the end of February. But when it comes to improving your financial life, resolutions really do make a difference. “A recent survey by Fidelity Investments found that people who made financial resolutions at the start of 2015 are in better financial shape than those who didn’t make a financial resolution,” Huddleston said. And it’s not just their money that was affected — these people reported feeling more optimistic overall (51 percent) compared with those who didn’t set financial resolutions (38 percent). “So if there are areas of your personal finances that need attention, you should resolve to make changes or improvements in the new year,” Huddleston said. Once you know the area of your finances that needs improvement, it’s time to get specific. The goals mentioned above — to “save more, spend less” or “pay down debt” — are good places to start. “Given that the savings rate in America is so low and the consumer debt level is so high, more people should be resolving to save more and pay down debt,” said Huddleston. Whatever your goal, figure out what that will look like each month and even each week. If you want to get out of debt in 2016, set a goal for how much extra you want to pay monthly and on which balances. For savings goals, decide how much you need to save, and break that down by week or month. If you don’t have enough room in your budget to meet debt or savings goals, look at your expenses to see where you can scale back. Methodology: This survey was conducted as a Google Consumer Survey, conducted from Nov. 24-27, 2015, and collected responses from 5,004 people. The findings are representative of the U.S. online population with a margin of error of 1.9 percent. The survey posed the question, “What are your 2016 resolutions? (select all that apply)” with the option to select “None of the above,” or to select any or all of the following six resolutions, displayed in random order: (1) enjoy life to the fullest, (2) live a healthier lifestyle, (3) lose weight, (4) save more, spend less, (5) spend more time with family and friends and (6) pay down debt. For the analysis of resolutions, respondents who selected “none of the above” (35.8 percent) were excluded. Insights based on age, gender and geography were found using only respondents for which the relevant metadata were available.